Crowcon, the gas detection specialist, has today announced the availability of a new portable gas solution for bump testing. The new method eliminates the need to carry around cumbersome gas bottles and docking stations or return to base to test handheld gas detectors. Resulting from an innovative reapplication of existing technology, the Crowcon Bump Test Gas Spray performs bump tests on handheld gas detectors, either on site or on-the-road, using a 12 litre spray canister. 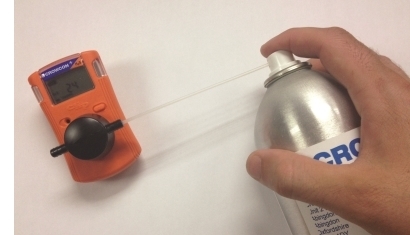 The gas is simply applied through a straw on the canister nozzle and a small amount of gas is sprayed into a calibration cap placed over the sensor. Traditionally, to conduct a bump test, an engineer would require heavy gas bottles, regulators, docking stations and other associated paraphernalia, but for most, this really is not an option. Engineers on-the-road have been asking for something to address this challenge. Crowcon is offering this solution as the most cost-effective and easiest way to bump test when mobile. Less equipment means less weight to carry and more room for storing productive equipment. Spray canisters are also covered by less demanding regulation (directives UN1950), helping keep costs down further.